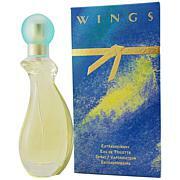 Launched by the design house of Giorgio Beverly Hills in 1992, Wings possesses a blend of rare exotic florals with drying notes of amber, musk and woods. It's the perfect spray-and-lotion combo for a touch of romance. EDT SPRAY INGREDIENTS: ALCOHOL DENAT., PARFUM/FRAGRANCE, WATER/AQUA/EAU, BENZYL SALICYLATE, BUTYLPHENYL METHYLPROPIONAL, PROPYLENE GLYCOL, BHT, ALPHA-ISOMETHYL IONONE, BENZYL ALCOHOL, BENZYL BENZOATE, BENZYL CINNAMATE, CINNAMYL ALCOHOL, CITRONELLOL, EUGENOL, FARNESOL, GERANIOL, HYDROXYCITRONELLAL, HTDROXYISOHEXYL 3-CYCLOHEXENE CARBOXALDEHYDE, ISOEIGENOL, LIMONENE, LINALOOL, BUTYL METHOXYDIBENZOYLMETHANE, ETHYLHEXYL METHOXYCINNAMATE, ETHYLHEXYL SALICYLATE, YELLOW 5 (CI 19140). BODY LOTION INGREDIENTS: WATER/AQUA/EAU, CYCLOPENTASILOXANE, PARFUM/FRAGRANCE, BUTYLENE GLYCOL, CETEARYL ALCOHOL, CAPRYLIC/CAPRIC, TRIGLYCERIDE, GLYCERYL STEARATE, CETYL ALCOHOL, ISOPROPYL PALMITATE, TOCOPHERTL ACETATE, DI-C12-15 ALKYL FUMARATE, SODIUM PCA, ALLANTOIN, PANTHENOL, TRICETEARETH-4 PHOSPHATE, PEG/PPG-18/18 DIMETHICONE, cARBOMER, TRIETHANOLAMINE, BHT, DISODIUM EDTA, DIMETHICONE, DIMETHICONE CROSSPOLYMER, ALPHA-ISOMETHYL IONONE BENZYL ALCOHOL, BENZYL BENZOATE, BENZYL CINNAMATE, BENZYL SALICYLATE, BUTYLPHENYL METHYLPROPIONAL, CITRONELLOL, GERANIOL, HYDROXYCITRONELLAL, HYDROXYISOHEXYL 3-CYCLOHEXENE CARBOXALDEHYDE, LIMONENE, LINALOOL, METHYLPARABEN, PHENOXYETHANOL, PROPYLPARABEN. I love the smell it stays on me all day long!!!! Not very loud but it does give the scent that I love to wear and plus I love Giorgio. Light, Long lasting & slightly sweet. Paired with the lotion, it is not overpowering! Excellent to wear year-round!